We’ve all come to create relationships with the city—at times we feel lost and small, like we don’t have a place, but at the same time our place is just simply being present here. Occupying the Articule gallery space until the end of Feb. 28, Sans titre, otherwise known as Repérages ou À la découverte de notre monde is a collaborative, multi-titled exhibition that projects this idea of belonging and isolation, which is relatable to the city’s inhabitants. Dominique Fontaine, the in-house curator, has been working with Articule for over a year. The exhibit is part of her artistic research residency, Scenes de la vie quotidienne à Montreal (on belonging and the politics of belonging). The show is made of numerous works by Montreal-based artists of different cultural backgrounds. 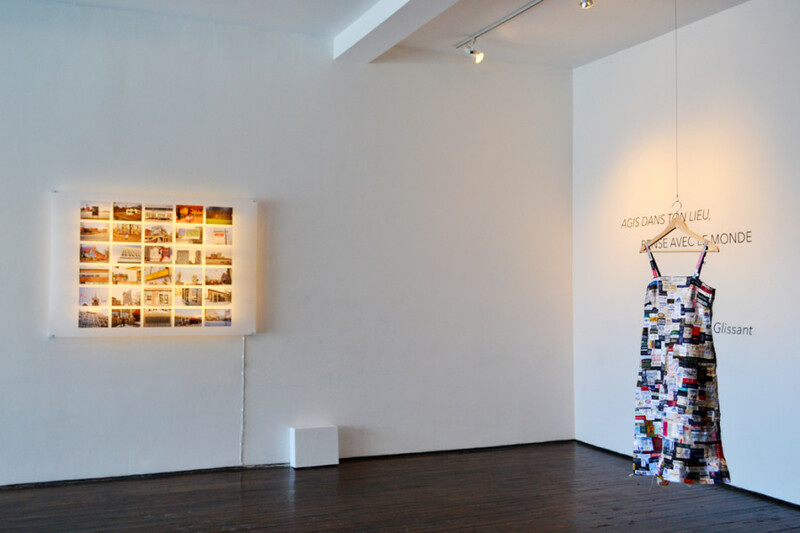 Hanging in the center of Articule’s gallery is a mysterious, multi-coloured dress that, upon further inspection, is made entirely of clothing labels. Fontaine said that the dress has been in the works for 15 years, and doubles as both a performance piece and a static work. The artist, Maria Ezcurra wore the dress at the opening vernissage, collecting more labels from attendee’s clothing throughout the night, Fontaine said. In another corner of the gallery, the words “Agis dans ton lieu, pense avec le monde” are superimposed over a blank wall—a quote by Édouard Glissant, the notable Martinican writer and poet. The extract sets the tone for the exhibit, a reflection of cultural thought and the intangible relationships between people and their cities. Sans titre only features a handful of pieces, ultimately leaving the open space feeling quite empty. The five correlating pieces by different artists—Natacha Clitandre, Maria Ezcurra, Olivia McGilchrist, Romeo Gongora and Cécilia Bracmort—which viewers can follow using a guide. “Une saison vers 17h45,” the first element of the show, takes up a little more than half a wall. Small circles in multiple shades of blues and grays litter the scene, running up the length of the wall to form a minimalist cartographic representation of Montreal. During spring of 2015, artist Natacha Clitandre followed a daily routine of photographing the skies above her, documenting and recording the colour, her whereabouts and the feeling that the moment inspired within her. On the opposite wall, each circle is represented textually. Glowing softly next to the sky map is a backlit plastic canvas, featuring a 5×6 photo grid. Entitled “Des deux bords,” the grid is a collection of places that pertain significance to the Caribbean and wider Black community of Montreal. 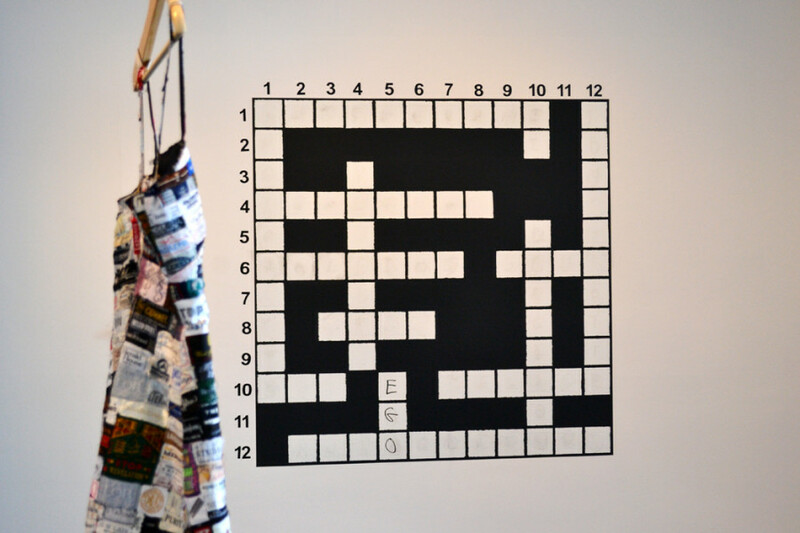 The final piece residing on the gallery’s walls is a crossword puzzle with one word filling in its blank spaces: “ego.” The crossword materialized as the product of a workshop inspired by the 1973 book Le Quebec en mutation by Guy Rocher. Although the exhibit doesn’t fill the entirety of the space, leaving room for more art, those interested in the notions of cultural identity and belonging may find that the show uncovers a new perspective of what it means to be part of the city of Montreal.